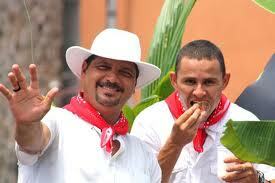 Costa Rica’s “Romeria” to Cartago! Give thanks to the Virgin of Los Angeles! Well it’s that time of year again….the end of July and as August 2nd quickly approaches, the “Romeria” of pilgrims can be seen walking, riding, cycling and including other ingenuous means of transporation along the Pan American Highway and along other main roads of Costa Rica that lead to the city of Cartago where they will participate in the annual celebration of the “Virgen de Los Angeles”, this country’s patron saint. 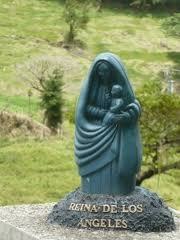 stone said to resemble the Virgin Mary with child in her arms to her home and locked it up. It is said that the small 6 inch stone image almost immediately disappeared, only to mysteriously return to its original spot on the rock in the woods where it was originally discovered. This happened not once, but numerous times, including after giving the stone to a local prominent priest, who then proclaimed it to be a miracle and so began it’s high regard throughout the country! The legend lived on, and in 1824, “La Negrita”, as the black Virgin image is referred, was officially bestowed as the patron saint by the Costa Rican government. Today, this small statue rests on a golden and bejeweled platform above the altar at the Basílica Nuestra Señora de Los Angeles in Cartago, some 14 miles east of San José, which was purposely built around the rock where the small figure first appeared. 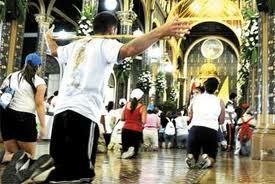 This religious holiday is a unique experience for both nationals and visitors of Costa Rica, as they get to experience the true culture and dedication of the Ticos to their beloved Patron Saint. Pilgrims can travel up to 2 weeks to arrive to the Basilica in Cartago to get a firsthand look at the statue of “La Negrita”, which means “little dark one” in Spanish, as that is the color of this beautiful stone figure. Local legend proclaims that a small stream with curing powers is situated in proximity of the Basilica, and this “holy water” is said to cure all forms of sickness and physical ailments, so many pilgrims will collect small amounts of this special water during their annual pilgrimage. 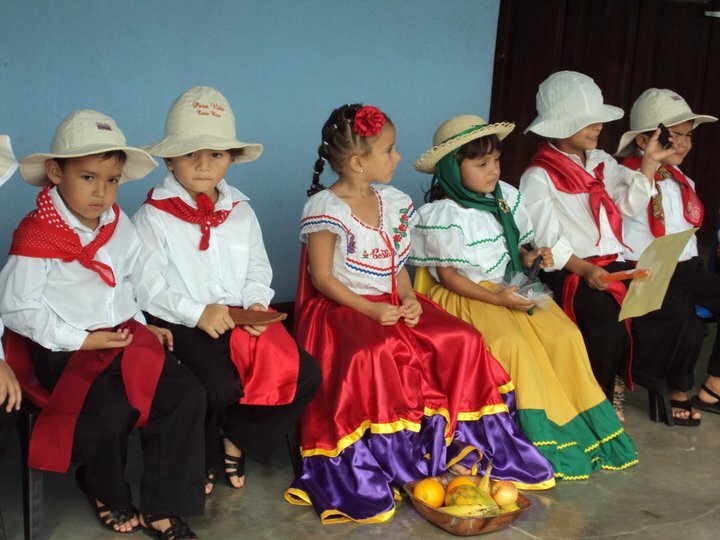 knees, some with their last ounce of strength, as a means of thanking La Negrita for favors, as well as to pray for help to overcome their sicknesses and/or physical and mental disabilities. Since there can be some 2+ million annual visitors, some pilgrims choose to pray by the stone where the image was originally found, as the surrounding areas of the Basilica can be overwhelmed with people seeking a look at the “La Negrita” statue. 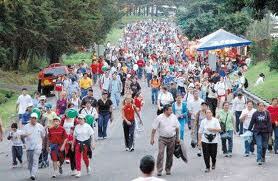 An example of how popular this yearly event is, in 2003, 1.5 million people descended upon the city of Cartago for the dedication to “La Negrita”. 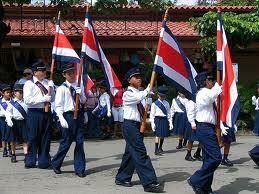 At that time that number represented close to 40 percent of Costa Rica’s entire population! 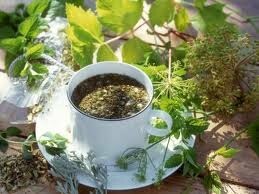 people, EARTH University created the program “Eco Romería” starting in 2011. A press release from the Health Ministry said that more than 80,000 plastic bottles and 27 tons of organic material were collected last year. This year, garbage cans will be placed every 500 meters along the main routes leading to the Basílica, as well as the Red Cross will be available along these same main routes and at the church to attend to folks with dehydration, blisters and other side effects of the long arduous trek. The Lumaca bus company has also committed some 270 buses to provide transportation from San José to the Basilica Church so visitors can enjoy the outdoor mass on August 2nd. 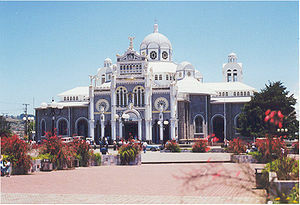 The Basilica was built in 1639 and was later partially destroyed by an earthquake. The restored Basilica offers an impressive mix of colonial architecture combined with 19th century Byzantine style and is consecrated to the Virgin of Señora de los Ángeles, it truly is an impressive church. 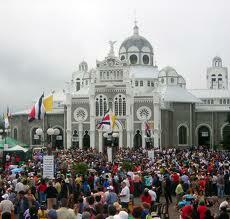 Cartago is beautiful to visit and the climate is cool and refreshing. The display area at the Basilica de Los Angeles is worth a stop to see the Virgin statue and the rock she was found on which in truth is actually a replica, as the original Virgin statue is now held at the Vatican. The replica statue, sanctified by the Pope, is kept at the Cartago Basilica and is now what the “romeros” will see upon arrival. Don’t forget the Holy Water! Don’t forget to bring a small container, so you can receive some free holy water that flows from a river that sits below the church and has been blessed by the Basilica’s priest, its said to be the ultimate healer! Feel free to report back to me if the holy water does in fact cure your sickness, physical or mental health……as it never hurts to have a firsthand account that is was worth the long arduous trek! Pura vida! Costa Rican Guaro! Belly up to the Bar and Party! Popular throughout Central American countries, though not readily available in the USA, “Guaro” is a distilled liquor originating in Costa Rica. Manufactured from sugar cane juice, Guaro has a high alcohol content, clear coloring and a strong but slightly sweet flavor. Most commonly mixed with fruit juice or soda (Fresca being a favorite), few people choose to consume this liquor in straight shots. Referred to as an “aguardiente,” the words “agua” and “ardiente” when combined translate to basically mean Guaro is “burning water”. A fairly accurate description if you ask me! 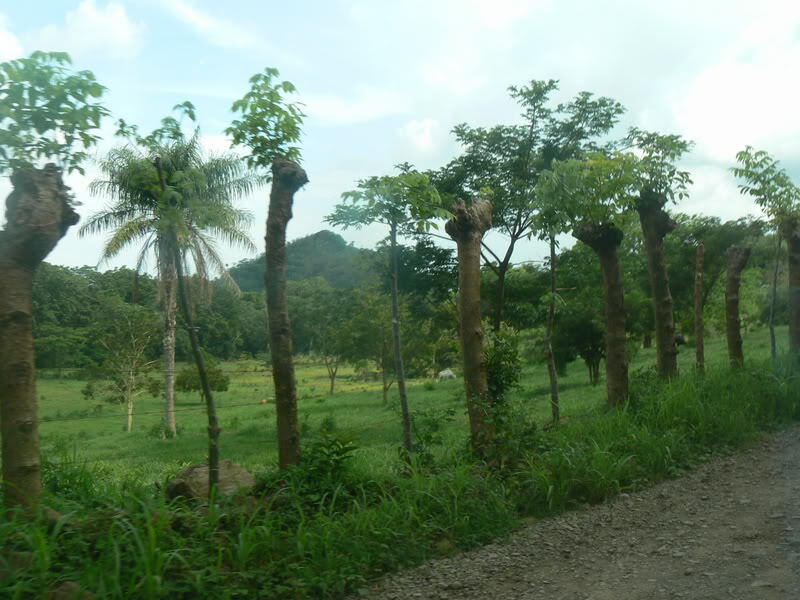 Once considered the “moonshine” or “chicha” of Central America, Guaro is no longer a product of homemade stills, but an almost patriotic part of Costa Rican popular culture. 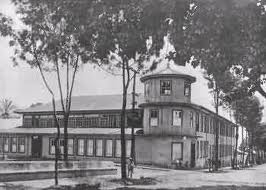 In an attempt to end the kitchen sink production of clandestine “Guaro”, the Costa Rican government approved the manufacturing and eventual bottling of the clear liquor by Costa Rica’s National Liquor Factory (la Fábrica Nacional de Licores or “FANAL”) back in 1851. 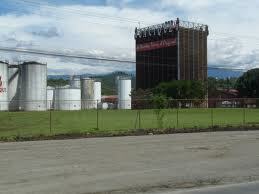 At that time it was sold in barrels via “liquor agencies”, with the clients providing their own container. 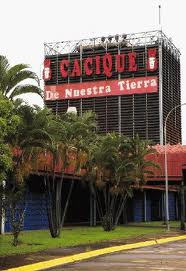 Starting in 1980, a new division was created in FANAL, with “Cacique” becoming the official Guaro brand name in Costa Rica. 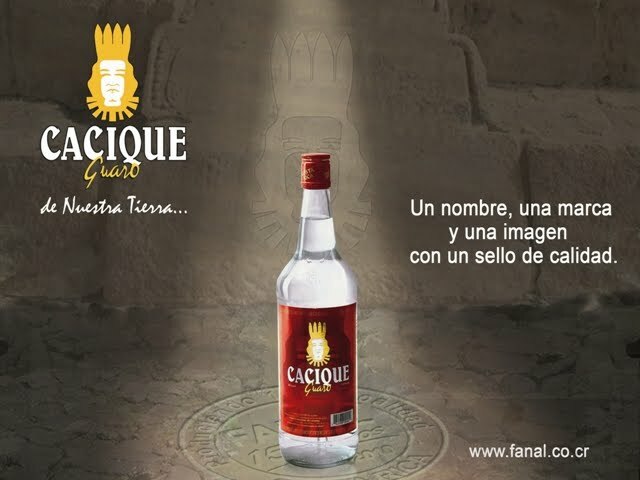 With it’s distinctive red label and iconic Indian Chief (that’s what “Cacique” means….Chief), Cacique quickly became the more commonly used name, since “Guaro” can often times refer to almost any distilled spirit. 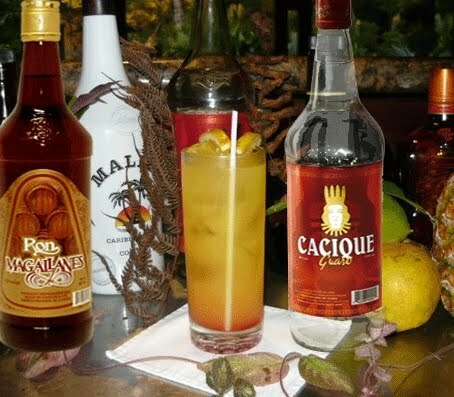 Easily one of Costa Rica’s most popular “beverages”, bottles of Cacique line the shelves of every Costa Rican grocery store and bar in even the most remote corner of this country, as well as being offered at every Costa Rica Hotel and Restaurant to be found. FANAL originally decided to market this popular liquor in 1 liter glass bottles containing a lower alcoholic content then vodka, but with the continued growth in popularity, they later began providing consumers with the options of 750 ml glass bottles and 365 ml “pachitas”….or plastic bottles (the handy travel size!). FANAL takes great pride in producing a high quality product of licensed ethyl alcohol, guaranteeing a high purity for “safe” drinking. 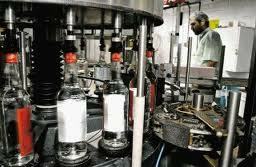 The brand has proven so popular, that over the years it hs expanded from only 60 proof Guaro Cacique (with the red label) to the 70 proof Cacique Superior (with the black label), the latter offering an even higher purity of “rubbing alcohol”via further filtered purification through activated carbon and increasing not only it’s purity, but perfecting it’s mostly neutral aroma. They also produce a lesser know black label, offering a whopping 80 proof and referred to as “Super Caňita” (Super Cane)! 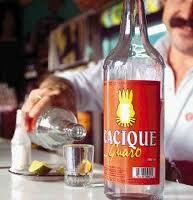 The present name of Guaro as “Cacique” (or “Chief”) is thought to originate from FANAL. Since several circumstances. Between 1977 and 1980 an excavation made by the Costa Rica National Museum revealed on of the largest indigenous settlements to date near the town of Grecia on land that occupied by the liquor had remained for decades as one of Costa Rica’s most enduring and popular products, indigenous societies considered their “leaders” to be their “Chiefs”, thus the name “Cacique” stuck. Often times referred to as “Cuatro Plumas” in joking reference to the Four Feathers on the chief’s headress found on the ubiquitous red labels, just saying the word “Guaro” brings smiles to almost every Tico’s face! Now, some 160 years later, Guaro continues to be as popular as ever!In fact, this liquor is such an integral part of Costa Rican culture that a recent exhibit at the Museos del Banco Central (Central Bank Museum) featured one work representing three icons of daily Costa Rican life; Cacique Guaro, a Soccer Ball and a representation of the celebrated Black Virgin! 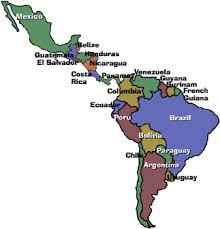 For those of you lucky enough to be visiting beautiful Costa Rica, a little word of warning….. the pronunciation of “water” has been known to be misinterpreted as “guaro” by eager waiters not completely versed in the English language. This has led to incidences where thirsty American tourists having asked their waiter for a glass of water and the waiter, ever so happy that the tourists wanted to try his country’s famous Guaro returned from the kitchen with a glass of the clear beverage. The tourist innocently takes a generous swallow and have experienced a coughing and sputtering surprise in Costa Rican thirst-quenching!! Consider yourself warned!! The Blue Morpho Butterfly….A Natural Beauty in Costa Rica! Hard to believe, but there are almost 24,000 species of butterflies the World. One of the prettiest and most impressive species are the Blue Morpho butterflies. Not only are these beautiful butterflies common to Costa Rica, but they are one of the most sought after species by collectors and nature lovers alike who seek to experience them in their natural habitat, as they mesmerize you with their incredible bright blue metallic coloring that serves as an incredible contrast to the lush green rainforests of our Central America paradise. 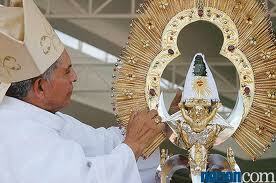 in Central and South America, with high concentrations in both Mexico and Costa Rica. 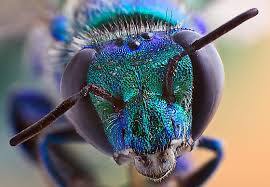 These incredible insects are easily spotted by their large beautiful bright blue wings that reflect light as they fly by in their distinctly erratic pattern. 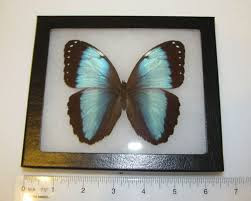 Size: Blue Morphos average approximately 5 – 6 inches wide, though some species will be smaller. 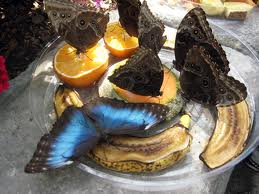 Diet: The blue morpho’s diet changes as it passes through each stage of life. As a caterpillar, the Blue Morpho chews leaves. When it “morphs” to become a butterfly, it begins to drink its food instead, using a long, protruding mouthpart called a proboscis as a literal drinking straw. 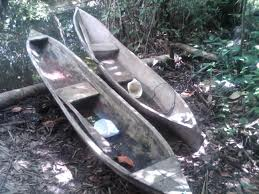 They use this to sip the juice of rotting fruit, the fluids of decomposing animals, tree sap, fungi and wet mud. Blue Morphos can actually taste fruit with sensors located on their legs, and they “taste-smell” the air with their sensitive antennae, which function as a combined tongue and nose on the go. Average life span: The life span of the Blue Morpho butterfly is short. They generally live only 115 days, with most of their time focused on feeding and reproduction. 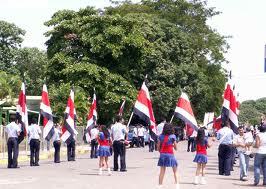 large population found in Costa Rica. Adult morphos spend the majority of their time on the forest floor or the lower shrubs and trees under the jungle canopy with their wings folded for protection from predators. 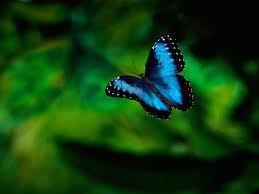 However, at the time of searching for mates, the blue morphos can fly through all layers of the forest attracting attention with their incredible iridescent blue wings. 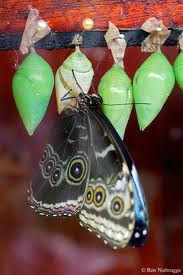 Breeding/Reproduction: Although butterflies are some of God’s most beautiful creatures, they mostly just reproduce and sadly die immediately after laying their eggs. The male butterflies release chemicals called pheromones in their wings to attract as many females as possible in their pursuit for successful reproduction. The female’s eggs are fertilized, at which time they lay them in a safe place and fly off leaving them on their own for hatching. 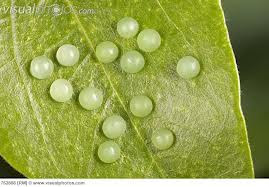 The surviving eggs will hatch after only nine days. butterfly body. When the morpho opens its wings, the dorsal or the back part of this insect is bright blue with the edges of the wings being black or a darker shade. This bright blue coloring is actually the result of the microscopic scales which reflect light, so when the blue morpho flaps its wings upon flying the bright blue back is in contrast to the front or underwings dull brown. This is what makes them look like they are appearing and disappearing as they fly erratically through the air. The male blue morpho has broader wings then the females and it appears to generally be brighter in color, while the female of this species has duller blue wings with sporadic white spots along the brown edging. instead. As mentioned above, at this stage they still use their proboscis to sip fluids of rotten fruits, tree saps, certain fungus’ and even wet mud. They also eventually use sensors on their legs to taste fruits, while their antennae act like a combo tongue and nose to “taste-smell” the air while in search of food. 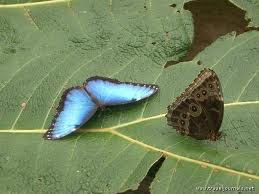 While spending time in Costa Rica, please remember that the Blue Morphos only have a life span of 115 days. Even with these few months to live, they also are constantly threatened by their natural predators (more birds than anything), as well as the constant threat they face due to habitat destruction by loggers, farmers and urban development. Lastly, sadly humans continue to be a threat due to their fascination to want to capture and display these beautiful insects to show off the bright and beautiful colors these beautiful butterflies display. When staying at your Costa Rica Hotel, please don’t support this destructive market by buying or encouraging the sale or displays of the Blue Morpho, their continued existence depends on your good conscience! Happy Travels to all, I hope you get to see a Blue Morpho during your vacation! Pura Vida! 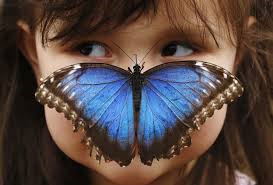 Fun Facts: • When the blue morpho flies, the contrasting bright blue and dull brown colors flash, making it look like the morpho is appearing and disappearing. • The “blue butterfly” has spiritual meaning for many native people of the rainforest, who see it either as a wish-granter or the complete opposite….a malicious spirit. • Blue morphos, like all butterflies, taste with sensors on their legs and taste-smell the air with their antennae to help them detect food while in flight. 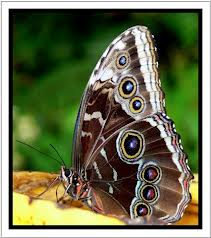 • Their beauty is brief: the entire blue morpho life cycle lasts only 115 days, so enjoy while you can. 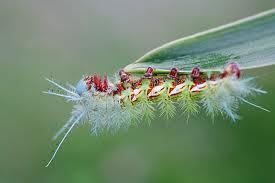 • If disturbed, Blue Morpho caterpillars will secrete a fluid that smells similar to rancid butter. 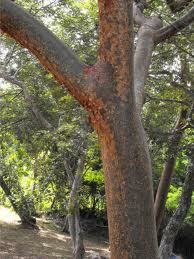 • The tufts of hair found on the caterpillars will irritate human skin. 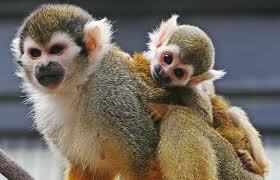 Squirrel Monkey or Mono Titi (in Spanish)… We´re too damn cute, don´t let us dissappear! Literally everyday I have the pleasure of being visited by one of the cutest little jungle creatures you will ever encounter……the friendly Titi or Squirrel Monkeys of Manuel Antonio, Costa Rica. The particular species that swings through our trees, climbs on our roofs, and even occasionally gets in our houses are found ONLY in the Manuel Antonio area. Our blessing, is this little monkeys curse though, as with continued development in the surrounding areas of Manuel Antonio and Quepos, these beautiful little animals have slowly been completely cutoff from their natural wildlife corredor, meaning the Titis of Manuel Antonio no longer have anywhere else to go! This not only limits their ability to naturally flourish, but results in an elevated level of inbreeding, more sickness, and a weakening of the species over time, putting in danger this species´ long term existence. Easily recognized by their soft light brown body furr, adorable little white with black facial “bigotes”, long brown with bushy black tipped tails, and friendly incesant chatter, their tiny size and endearing faces draw oohs and ahhs from all that encounter them, making them clearly one of the main attractions in and around Manuel Antonio National Park, located on the Central Pacific Coast of tropical Costa Rica. In search of a way to minimize the negative impact that this situation has caused, several local community organizations have emerged to help in the protection of this special little monkey. 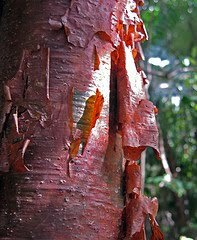 One of the most prominent in our area is www.kidssavingtherainforest.org. 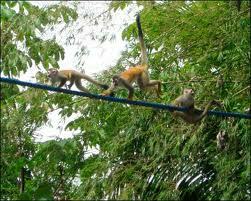 Some of their many objectives, has been the creation of ¨monkey bridges¨ throughout the area. These thick ropes are strategically placed where the monkeys naturally arrive to cross roads, highways or locations that have a large amount of electrical, phone, or other types of cables, or where the vegetation is not sufficient for monkeys to safely traverse. This helps the monkeys avoid electrocution, or from the creatures having to come down from the trees to continue their journey, a move that would make them terribly susceptible to predators, as well as other modern environmental hazards. This organization has also published an excellent list of 10 reasons why you should NOT feed the monkeys, which most hotels, restaurants and other businesses post in their establishments to help educate the community and the visiting tourists about the negative impact feeding the monkeys has. 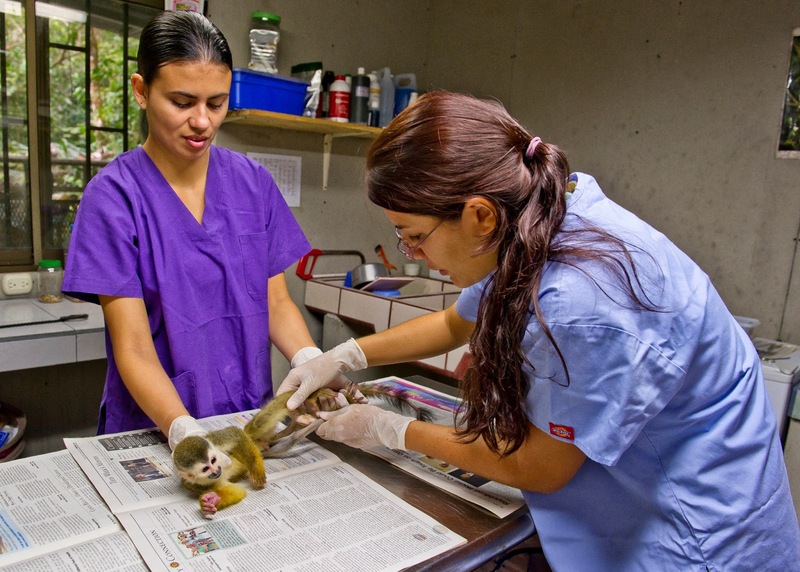 This not for profit organization has also been funding a wildlife rescue center for local injured monkeys and other animals, so you can now choose to visit and donate to their badly needed facility when in the Manuel Antonio area. Another excellent organization developed specifically for the protection of the Titi Monkey is www.titiconservationalliance.org. 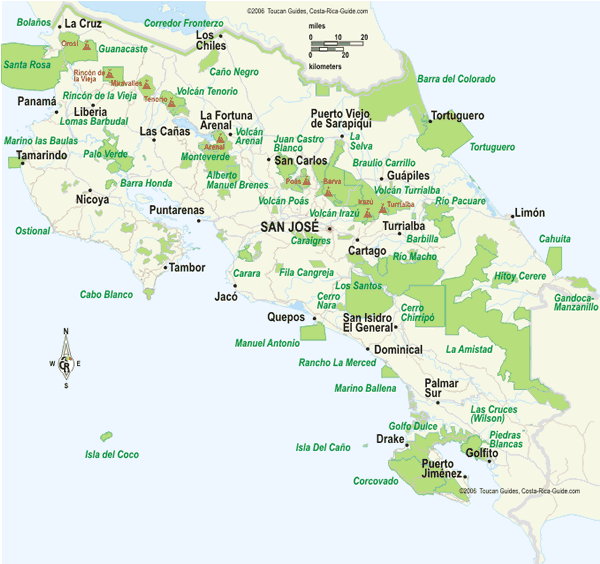 The Titi Conservation Alliance was started in 2001 by a group of business owners within the tourist industry based around Manuel Antonio National Park, Costa Rica. 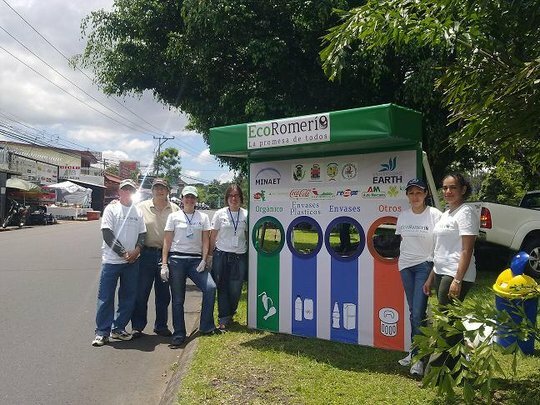 Recognizing the need for conservation of their natural environment to maintain prosperity for their businesses, this group of entrepreneurs began the Alliance with the mission to promote sustainable development and to conserve the biodiversity of Costa Rica’s Central Pacific Region. Today, the Alliance is composed of member businesses and individuals dedicated to saving the endangered titi monkey, and its habitat. Through dues paid by member businesses, donations from concerned tourists wanting to help protect the beautiful areas they enjoy visiting, and the efforts of our staff and volunteers, the Titi Conservation Alliance is working to protect Costa Rica’s Central Pacific region through Sustainable Development, Habitat Reforestation, and Environmental Education. 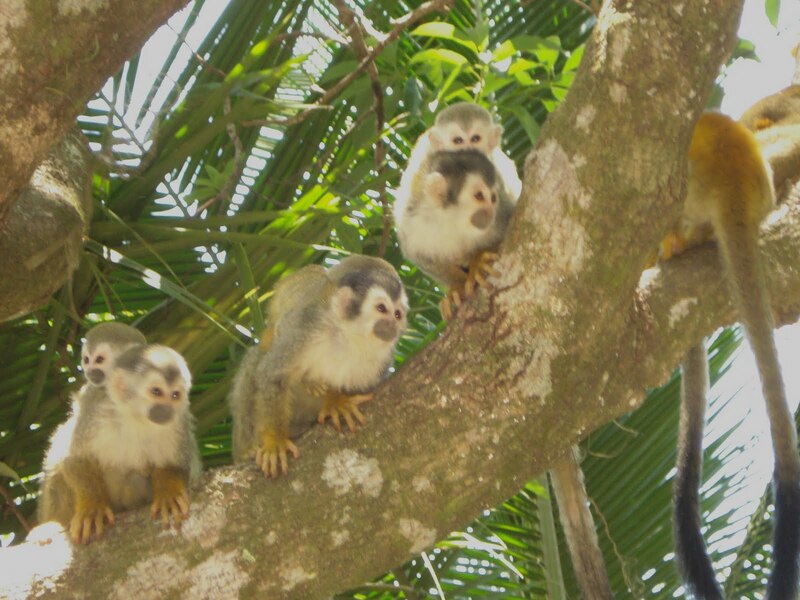 For those of you coming to Costa Rica, or if you have been trying to decide where to go on your next vacation, consider the Manuel Antonio area of this beautiful country, where not only will you have the opportunity to see these endangered little Squirrel Monkeys, but where many businesses will donate a portion of what you spend in our area directly for the Squirrel Monkey´s protection, so future generations will be able to enjoy the ¨Mono Titi¨ too!